Too many young journalists go into high-risk areas without proper safety training, without identifying mentors and without a true plan of what they’re going to do when they arrive, said Bruce Shapiro, director of the Dart Center for Journalism and Trauma. 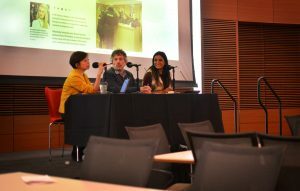 Shapiro was speaking Feb. 9 on a panel at “Cultures in Conflict: Navigating Culture Difference In International Human Rights Reporting,” a conference hosted by the University of Wisconsin-Madison’s School of Journalism and Mass Communication and The Institute for Regional and International Studies. The Center for Journalism Ethics was a sponsor of the event. Shapiro, Sheila Coronel, a journalist and co-founder of the Philippines Center for Investigative Journalism and Adriana Fernandez, an independent photojournalist, said journalist safety is an ethical obligation of media organizations and journalists. In recent years, all three panelists have seen growth in the discussion of journalist safety. Shapiro added that more generally, while physical injuries can be seen by the naked-eye, psychological injuries can be just as, if not more, debilitating to a journalist’s work, mission and career. According to Shapiro and Coronel, the rise in safety concerns has created an ethical obligation for employers to keep their employees safe. Coronel observed that threats to women specifically are actually worse in 2018 than they have been previously due to the addition of social media harassment. This can have a detrimental effect on many female journalists because women may decline assignments for fear of being harassed or threatened. “For the most part whether its physical, online or sexual harassment, women don’t complain or inform their bosses for fear that they’ll be taken off of their beats or lose their jobs,” she said. Shapiro noted that the ACOS Alliance, an organization that features a collaboration between news organizations, press freedoms, NGOs and journalists, is just one group committed to taking practical steps to improve the safety of freelance journalists in the field. Fernandez, an independent freelance journalist based in Caracas, Venezuela, added that “details matter” when covering high-risk areas. Coronel also said that journalists have an ethical responsibility in their reporting to stick closely with the facts, use as neutral language as possible and produce solid work to try and keep themselves safe in high-risk areas.